Please drop off your goodies at the school on December 10th. We will be selling the fudge for $3 a set, and the cookies will be $1 for 2. If you have any questions, please contact the committee chair, Denise Bulger, at denisebulger@hotmail.com. The next meeting of the West Royalty H&S Association is scheduled for tomorrow - Tuesday, December 4th - at 6:30 pm in the staff lunch room. Everyone is welcome to attend! One of the items on our agenda for this meeting is how to spend the funds raised through the magazine campaign. If you are unable to attend the meeting but would like to provide suggestions, please contact a member of the executive - click here for our contact information. Magazine Campaign... The Countdown is ON! We are now one week into the magazine campaign! With less than one week to go, here are some useful hints to help ensure your child submits his or her orders correctly! 1) ORDER FORMS: Form fields must be fully completed with the COMPLETE mailing address, magazine code AND name, and payment is recorded correctly. 2) If a CHEQUE is collected for payment, please ensure it is made out to West Royalty School. In the memo field, it is helpful to have your child's name recorded. 3) DUE DATES: The magazine campaign concludes on Monday, September 24. 4) LATE SUBSCRIPTIONS: Orders collected after the end date will be collected ONLINE ONLY. 5) EXPECTED DELIVERY: Late November into December, depending on the magazine. ONLINE orders are processed fastest! Thank you to all students, parents, families, and friends who are working hard to help raise money for our school! Your efforts are truly appreciated! Welcome to the 2012-2013 school year! On behalf of the PEI Home and School Federation (PEIHSF) board, I would like to say thank you for your involvement in and support of Home and School activities in your school communities. Over the coming year, we look forward to working with you and helping to strengthen the linkages among associations in the province. There are a number of things in the works to support you in your Home and School initiatives, including a refreshed website, Volunteer Training Workshops, Parent Engagement survey, our Semi-Annual meeting and more. Please share these provincial memos with everyone in your Association. To get us off to a quick start, it would be much appreciated if you could review the enclosed forms and upcoming event details, and respond to other information by the requested dates. "Building Capacity to Improve Student Achievement"
- Tuesday, Sept. 25 - Miscouche Consolidated, 6:30 p.m.
- Wednesday, Sept. 26 - Mount Stewart Consolidated, 6:30 p.m.
- Thursday, Sept. 27 - Prince Street Elementary, 6:30 p.m. Call PEIHSF office to REGISTER by Friday, Sept. 21/12. 58th Semi-Annual Meeting - Thursday, Oct. 18/12, 6:00 - 8:30 p.m., NEW location - Kanata Community Centre, Kinkora. Discuss resolutions, educational topics with Hon. Alan McIsaac, Minister of Education & Early Childhood Development and Jane McMillan, English Language School Board Superintendent. More info to follow. 60 Years of Home and School in Prince Edward Island = 60th Anniversary AGM, April 13, 2013. Stay tuned for future announcements! Hope everyone had a wonderful, fun-filled summer! We are looking forward to working with all of you during this school year. Check us out online at http://www.westroyaltyhs.ca. Please feel free to contact us with any thoughts or concerns. Home and School Association meetings will be held the second Tuesday of each month at 6:30 pm in the Staff Room, starting in October. Hope to see you there! Save Those Subscriptions for the Magazine Fundraising Campaign! The Magazine Fundraising Campaign will be starting SOON! PLEASE ignore those notices or calls from publishers and support your child's education by renewing your subscriptions through our school! If you are ordering magazines before then, our school will earn additional profit if you order at www.qsp.ca. Our Group number is 11843. If you have a question regarding your QSP subscriptions, you can call customer service at 1-800-667-2536 or our local representative Sandy McCarty at 1-888-399-8277 or sandy_mccarty@qsp.ca. The Magazine Fundraising Campaign will be returning in Fall 2012. Just For You Children's Centre in the West Royalty Industrial Park is going to be running an after school program for students in Kindergarten to Grade 3 and they still have some spaces available. For more information, contact Jane Fisher at 629-1226. The teachers and staff at West Royalty have done it again! On Friday, they released their second Dance Video, this time to the music of Party Rock Anthem. It even made the local news, garnering coverage on the CBC Evening News. If you haven't seen it yet, you don't want to miss it! Here are the links so you can check it ALL out! For the CBC coverage, click here. For the direct link to the YouTube video, click here. Now everyone knows what we already knew... YOU ROCK! The PEI Home and School Federation is trying to measure the cost to Island families of Professional Development Days (PD Days) for childcare, babysitting or other activities. We are doing this because the School Calendar is in the process of being reviewed, and we want to ensure that the true cost to Island parents of PD Days is considered when decisions are being made. We have developed a one question survey using Survey Monkey on a Facebook page and would like you to help us spread the word about this survey to everyone in our school family. 2. Forward this message using your Facebook account or email, to families (parents and teachers) in your school, asking them to do the same. NOTE: It takes only 1 minute (or less) to click on the survey link, read the question, fill in the box and click Done. On Tuesday, May 15, 2012, West Royalty Home and School held a successful math night through the Parent Engagement Initiative. The focus was on the "new math" for grades 3-6. Through this presentation we learned that Prince Edward Island’s new math is following the same curriculum as the rest of Canada. Ontario, Quebec and Nova Scotia are the last of the provinces to adopt this curriculum. The "new math" emphasizes an understanding of concepts, encourages students to work together to discuss how to solve a problem with guidance from teachers and teaches the students to apply the mathematics they know to develop new skills through examinations and questions. Following the information and example portion of the presentation, parents tried a math game, asked questions and were given three valuable websites that promoted math skills while having fun. Thank you to everyone that made this event a success and we look forward to learning new things through the Parent Engagement Initiative in the new school year. 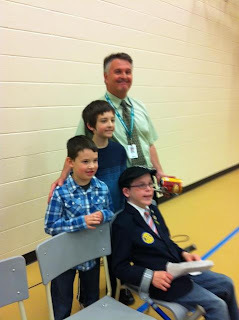 On Saturday, April 14, 2012, the Prince Edward Island Home and School Federation held their 59th annual meeting. Three representatives from West Royalty Home and School were in attendance. All resolutions were discussed and most passed which, if accepted by government and school boards, will ultimately improve the education for Island students. One resolution, submitted by Spring Park Home and School Association on class size/composition was sent for further research to be discussed at the Semi-Annual meeting to be held in the fall of 2012. Groups were given a discussion starter for the round table discussions. The hot topics were School board trustees-elected or appointed, Bullying, Keeping the spotlight on the Education Governance Report Recommendations and how is the PEI Home and School Federation helping your school? Some important issues were raised during these discussions. Many representatives agreed that the one school board must be democratically elected and NOT appointed and the Community Access Points (CAP sites) must be maintained since they are a vital linkage for families to their schools and other educational sites. The speaker for the luncheon was the Honorable Alan McIsaac, Minister of Education and Early Childhood Development. During the luncheon a presentation was put on by the Three Oaks Students’ Project and Awards were presented. The PEIHSF Volunteer of the Year Award was given to Patricia McKenna from Kinkora High School and a Life Membership Award was given to Bill Whelan for his many contributions to PEIHSF over the years. Easter Seals PEI is a not-for-profit project of the Charlottetown, Summerside and Montague Rotary Clubs. The PEI Easter Seals Society is committed to fully enhancing the quality of life, self esteem and self determination of Islanders with disabilities. The PEI Easter Seals Society responds to the needs and aspirations of children, youth, and adults with disabilities by providing services and support to enable access, inclusion and opportunity to promote increased activity and involvement. We support fundraising, services, public and consumer education, research and increased awareness of disability issues in the private, volunteer and government sectors. My name is Luke Gaudet and I have Cerebral Palsy. I live in Cornwall with my parents and my sister and brother. I have a great interest in cars, writing stories and music. I also enjoy swimming and being outdoors. During the summer I attend Camp Gencheff. Making people laugh is something that is important to me and I enjoy laughing too; it helps me stay positive. My motto this year is "You can do anything with a positive attitude". I am so excited to be this year’s Easter Seals Ambassador, the money raised through this campaign helps children with disabilities enjoy programs, have fun and stay positive. A group of creative students in Tracey Smith's class at West Royalty School turned a project in estimating numbers turned into a candy-counting fundraiser for the PEIHS! By collecting donations for each guess of how many ...candies were in a jar, students Grace, Kylee, Madison, Lauren, Sarah and Jacob raised an amazing $77.83 to help the animals at the Shelter. 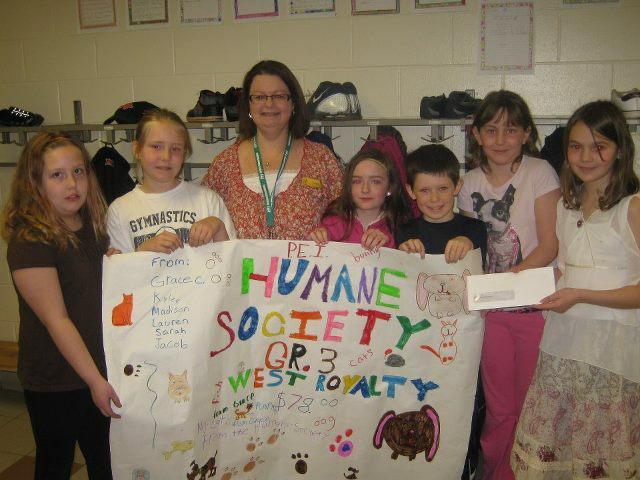 Lesa Donnelly from the Humane Society visited the class last week and also collected this amazing poster they created to help tell the story. It's on display inside the entranceway of the Shelter so we hope you stop by to see it soon! St. Jean Elementary is busy fundraising for a new playground. They are having a major fundraiser on Sunday, April 22 at 1 pm at the school. It will feature a Music and Magic Show with Mike Pendergast and Ron Wagner. There is also going to be a cake raffle and a 50/50 draw. Tickets are $10 per family and are available in the St. Jean office or at the door. This is a public event and will be loads of fun! Please help spread the word. To view the poster, click here. A Responding to Online Hate guide was released today by Media Awareness Network (MNet) to assist law enforcement, community groups and educators in countering hateful content on the Internet. Despite the growth in online hate and the fact that four out of five Canadians are online, there is currently little information available to the public on this topic: which lead MNet, Canada's leading digital and media literacy organization, to develop the guide. "The Internet has changed the face of hate speech, providing hate mongers with greater reach, a mask of anonymity, and new ways to appeal to youth", said Cathy Wing Co-Executive Director of Media Awareness Network. "The Responding to Online Hate guide will be an important tool in helping police, educators and community groups recognize hate on the Internet, and understand how youth are targeted online and can become radicalized through hateful online content." The guide offers information on how to report online hate to the police, host websites and Internet Service Providers. It also highlights services available to victims who encounter hateful materials online. The Responding to Online Hate guide is part of MNet's Diversity and Media Toolbox - an extensive suite of anti-hate resources for classroom and community use. The Toolbox and the guide are freely available at: www.media-awareness.ca. Hard copies of the guide can be ordered through info@media-awareness.ca. The Responding to Online Hate guide was produced with the support of the Government of Ontario. Media Awareness Network (MNet) is a Canadian not-for-profit centre for digital and media literacy. Its vision is that young people have the critical thinking skills to engage with media as active and informed digital citizens. MNet's programs are funded by sponsors, donors and partners, who include: TELUS . Google . Canadian Internet Registration Authority . Bell . Shaw . BellMedia . NFB. "HOME AND SCHOOL AND YOU"
Recently, the Canadian Home and School Federation (CHSF) called on the Harper Government to establish a Minister of State for Children and Youth. PEIHSF will begin a Twitter campaign "Support for Minister of State for Children and Youth! " to advocate for this position using the power of social media. Click here, http://www.edu.pe.ca/peihsf/ Follow us on Twitter with your comment. The Federation has signed up with Canada Helps to make it easier for the public to donate towards the work of the Home and School movement in Prince Edward Island. PAGE, a group of parent representatives from Parkside, Athena, Greenfield and Elm Street Home and School associations, released the results of a parent, staff and student survey conducted in their schools which focussed on bullying on March 28th. Contact Joanna Stewart 436-6120 or bjstewart@eastlink.ca for more details. The PEI Home & School Federation Annual Meeting/Convention will be held on Saturday, April 14th at the Rodd Charlottetown Hotel. Our annual membership fee covers all parents / teachers in our school. Everyone is welcome to attend but we must designate five voting delegates for voting purposes during the AGM business session. Prior to the meeting, West Royalty Home & School Association will review, discuss and vote on the resolutions. Please join us for this discussion at our April 10th meeting. The nominations deadline for the 2012 Awards of Recognition is March 16th. Please consider deserving recipients in our Home and School community for Volunteer of the Year Award of Merit and/or Life Membership Recognition.